More and more cities are passing legislation or taxes against disposable shopping bags, particularly because it is increasingly common for U.S. seashores and riverbanks to look like the one above—especially after a storm. Laws against throw-away shopping bags make good sense if you consider that in the U.S., we go through 100 billion plastic shopping bags every year, costing retailers about $4 billion dollars. Although people think plastic bags are “free,” not only do stores hide their cost in higher prices at the register, but plastic bags actually cost taxpayers .17 cents per bag in pollution clean-up costs too. In the state of California alone, public agencies spend more than $25 million annually to manage plastic bag pollution. That’s a lot of money that could be much better spent. Plastic bags are the second most prevalent form of litter after cigarette butts, and over 4 billion bags get caught by the wind and end up clogging storm drains and littering our forests, rivers, lakes, beaches and oceans every year. The United Nations Environment Programme estimates that there are now 46,000 pieces of plastic litter floating in every square mile of ocean! Plastic bags are known to kill over a million birds and hundreds of thousands of sea turtles, whales, seals, and other marine mammals every year. Plastic bags are often mistakenly ingested by animals, clogging their intestines, which results in a very painful death by starvation. Other animals or birds become entangled in plastic bags and drown or can’t fly as a result. Plastic bags are made of petroleum-based polyethylene and require 12 million barrels of oil to produce each year—a nonrenewable resource that creates more greenhouse gases and increases our dependency on foreign oil. That’s over $500,000,000 in oil that our country could be saving to put towards clean, green energy and jobs. Instead we are literally throwing the oil away. Less than 1% of plastic shopping bags are recycled, and they take a thousand years to decompose in a landfill. As polyethylene breaks down, toxic substances leach into the soil and enter the food chain. And the 4 billion bags that escape into the wind every year? Most end up as litter in the ever-growing Great Pacific Garbage Patch, an oceanic landfill the size of Texas, where they remain toxic indefinitely. 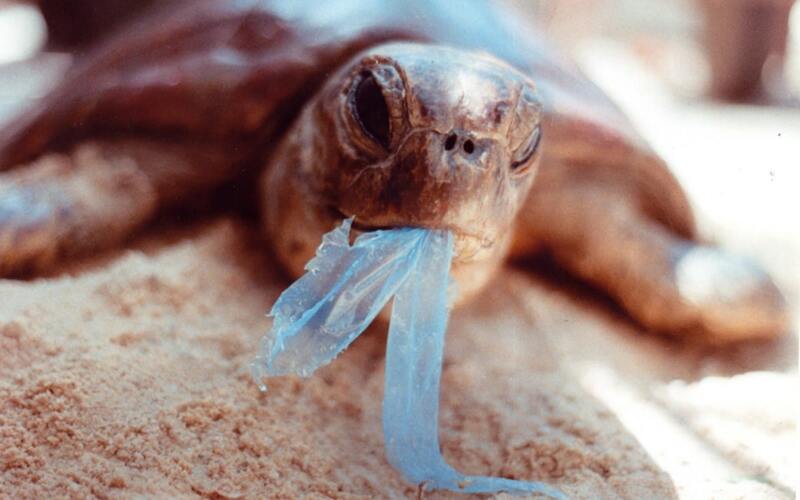 Anything we can do to phase out disposable shopping bags quickly would be good thing. In many ways, paper bags are even worse than plastic bags. Each year, Americans use about 10 billion paper bags, which results in the cutting down of 14 million trees. Four times the amount of energy is used to manufacture paper vs. plastic bags, and 98 percent more energy is used to recycle paper vs. plastic bags. Paper sacks generate 70 percent more air pollution and 50 times more water pollution than plastic bags. Paper bag production also adds to climate change in two ways: Forests (major absorbers of greenhouse gases) have to be cut down, and then the subsequent manufacturing of bags produces greenhouse gases. And paper bags don’t decompose any faster than plastic bags, once they end up in a landfill. Paper bags may be biodegradable in your compost pile, but once you’ve thrown them away, you’ve ensured they will never will. Very little in a landfill ever decomposes because there is no air. Even food waste can take decades to break down. However, plastic bags are not the more sustainable solution as they use more fossil fuels and raw materials energy, and consume larger amounts of crude oil and natural gas than paper bags. Sea turtles often mistake floating plastic bags for yummy jellyfish, and choke to death on them. Reducing your footprint and becoming more self-reliant is a lifestyle change. And like quitting smoking, eating better or any other lifestyle improvement, if you don’t put a system in place to make living sustainably easy—if not effortless—it will be almost impossible to integrate new, positive changes into your life permanently. To sustain any new endeavor, you’ve got to set yourself up for success! So, after thinking long and hard about how I could make remembering my reusable bags effortless, I came to the conclusion that it is the mismatched sizes and unwieldy shapes of most cloth bags that get reused for shopping that make them extremely inconvenient to use. And incredibly forgettable on the back of a doorknob or under the seat of a car. And significantly less convenient than just getting a paper bag at the store. Such a system is designed to fail, especially on those unplanned shopping trips. Who likes having to schlep around a big cloth bag full of cloth bags? And are you really re-purposing that old charity totebag if you never actually remember to carry it into the store? They fit in my pocket. I believe that if you can’t make a new habit easy—that is, if you can’t find a way to make new choices become natural in your day to day routine—then most people simply won’t succeed. Other things will take priority, despite the best of intentions. It’s human nature to take the path of greatest familiarity or least resistance; it’s not “lack of discipline” or “poor memory.” There are plenty of things people are very disciplined about and always remember. It’s just that reusable bags seem so, well, unimportant by comparison, that they seldom cross your mind until it is too late. So the best solution for me was to use those old tote bags to store potatoes, or pack clothes for donation, and instead buy a set of ultra-compact reusable bags that specifically fit into a pocket or on a keychain. My old tote bags still get reused (better, I think), and I always have at least one reusable bag everywhere I go. Win-Win! I just love my ultra-compact reusable bags. I have used the same five Envirosax bags for over 15 years now, and they have been worth every penny. Tough, lightweight, washable polyester, these really pretty bags are one of the few ultra-compact shopping bags that fit over your shoulder, so your hands are free to use your keys, guide your toddler, etc. Envirosax bags amazingly hold the equivalent of 2 supermarket plastic bags, yet they fold down small enough to stow into a pocket or handbag. They fold down so small, in fact, that I carry at least one in every purse I use so I always have one right next to my wallet anywhere I shop—from the drug store to the fabric store to the plant nursery. After setting up a successful system to remember your reusable bag, doesn’t it seem a little silly to then fill them up with lots of disposable plastic vegetable and bulk bags? To cut the throw-away plastic out of grocery shopping entirely, I also use reusable produce bags and bulk item sacks. The produce/bulk bags I use also fold up very small, and weigh almost nothing. I keep them folded up inside my Envirosax 5-pack pouch, and the whole shopping bag kit fits into a space no larger than 5″x7″x2″ in my purse—so I have no excuses for not using them! No more plastic disposable bags, no more forgettable random tote bags, no more guilt—and a lot more class and style. Ultra-compact, reusable bags can make shopping a little more fun and lot more eco-friendly. What more could you want? Which is more environmentally friendly: paper or plastic? How much does it cost to clean up plastic bags? 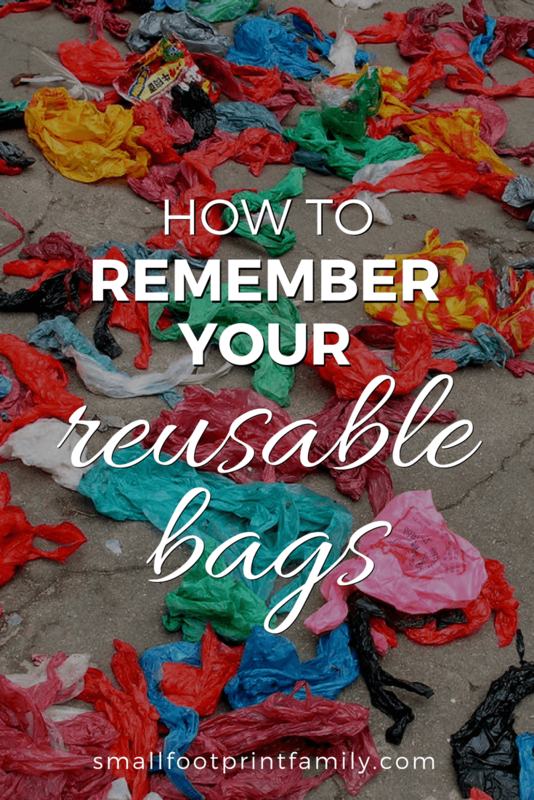 How do you remember your reusable bags? Please comment below! Great idea, but made of polyester, and in China? That’s a bit too cringey for me. Lots of good information in your articles, though. I’ve been using the same bags for over 20 years now. Sometimes it pays to buy durable goods, even when made from polyester. This post is fantastic, Really informative. I never ever actually considered this before but it absolutely makes sense for making use of reusable bags. What do you use to throw garbage out? In most cities, you can put trash directly into your municipal trashcan for pickup, without a bag. But the best solution is to create almost no garbage. Most food waste should be composted, and cans and bottles get recycled, which removes the wet stuff from the indoor trash, making it really easy to go without a bag. If something is particularly yucky (like used soup bones), I will take it out of the house and put it directly into the municipal can so the kitchen can stays cleaner. Here in Australia the supermarkets produce their own reusable shopping bags. They are all the same size and shape and have a loop to hang them onto the plastic bag rack at the checkout. The cashier simply hangs the bags on in front of the plastic bags and fills them for you as she scans the items. It’s a great system and they’re now putting a hook for them on the trolley so you can carry them better while you’re shopping. what do you use as freezer bags? I use waxed butcher paper for many frozen things, or I use glasslock or Mason jars. I also occasionally use BPA-free, plastic containers. Nothing will help you remember to take your bag except good habits!! I really love your blog…but do you think that it is really beneficial to buy these reusable bags that are made in China? Doesn’t that take away something from it’s benefits? I am a knitter, and I decided to make myself a reusable mesh bag — but even better, I was going to use all of my scraps of sock yarn to do so! It didn’t take me long to figure out that, if I used up all the scraps of sock yarn I 1) still wouldn’t have enough to finish the project and 2) wouldn’t have scraps of sock yarn to darn my socks when they wore out. So I went to the yarn shoppe (never a chore for me) and bought a skein to finish the project. I finished the project, and proudly took the bag to the store to use. Not a good idea to toss in a box of butter — sharp edges and all that, but we survived. Now, if I would simply remember to bring the bag! For some reason, I’ve never gotten the hang of the fold-up-tiny bags, although I’ve been given several as gifts and I do keep them in the car glove compartment in case of any unplanned shopping done by car. My trick for remembering my cloth bags is to hang them on the same shoulder as my purse. Many of the stores where I shop have membership cards or discount cards that the cashier scans at the beginning of the transaction, so I’m reaching for my purse to get the card and I notice the bags and give them to the cashier. If I can walk to the store, then I’m carrying the bags the whole time; if I take the car, I set down my purse while I’m driving, so I just set the bags on top of my purse so I can’t help seeing them when I get out of the car. All this depends, though, on remembering to take the bags when leaving the house! My trick for that is to put my shopping list in the outer pocket of one of the bags. I need to take my list, and then when I pick it up I’m instantly reminded to get the bag(s). It’s Party Time over at Debt Free Mommy Blog and you are invited! Please come link up anything related to making your space better at http://debtfreemommyblog.blogspot.com/ and mark your calendars for every Making Space Mondays linky party. The fun begins at 9:00 pm tonight. Hope to see you there! This is some important info to think about. Thank you for sharing on Saturday Show and Tell. I hope you’ll be back this week. This is an excellent post with lots of really valuable information and tips. Your Envirosax bags are lovely. I always keep lots of reusable bags in the car, and I have a couple of fold up ones for my purse, so I usually have them with me, but every once in a while I do forget. I’ll have to look into the Workhorse bag as well! When I saw your title its not what I was expecting. The pics and the shock sent the message home. I so many reusable bags and I mostly forget them. Then again, I’d forget my head if it wasn’t screwed on. Great post well presented. One thing I never hear discussed is waste disposal a.k.a. trash! I seldom have more than about 1/2 of a paper bag per week. The rest is recyled or composted. I presume I should locate some type of biodegradable, but if they don’t work in a landfill, what is the best option. I always place my bags on the counter first, and still, by the time the cashier starts bagging them, he/she has frquently forgotten they are there and I have to remind him/her. It’s annoying, BUT….it doesn’t keep me from using them. I bought some really well-made ones some years back, and they are holding up to constant use and frequent washing/drying. I’m so glad I did it. Eventually, these cashiers will get used to it, but until then, I’m just vigilant. P.S. : I don’t have kids and I’m sure this is harder to do when you do. I remember those days. 🙂 Do your best! Those Envirosaks are made from polyester which is a petroleum by product! 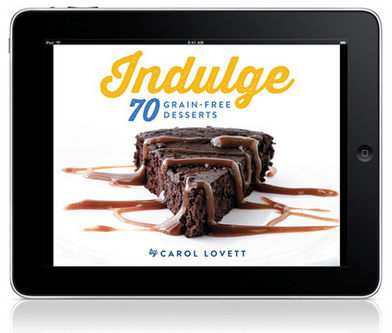 You are still using an oil product and next to your food! Switch to organic cloth bags. In a country that is 100% dependent on fossil fuels for just about everything we use, it is important that we choose to use them wisely. 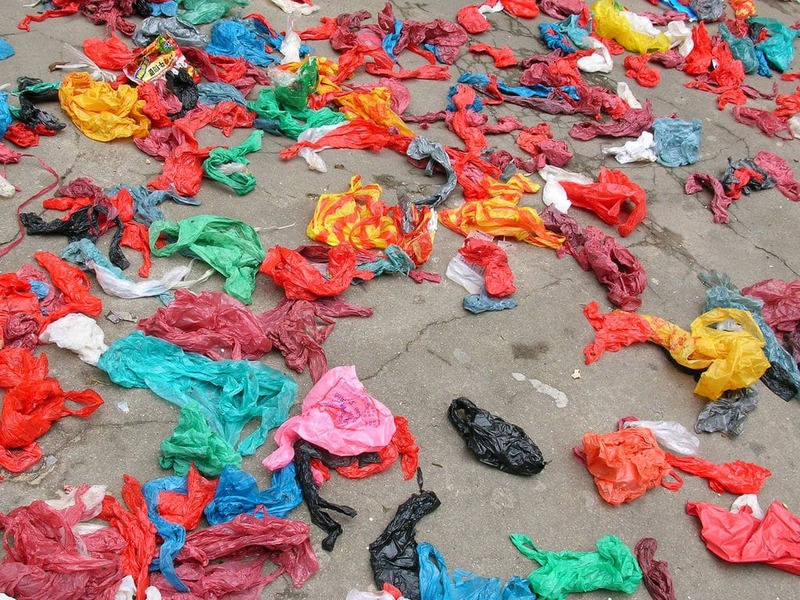 Single-use plastic bags that pollute and kill wildlife are a very, very poor use of oil. A reusable bag that lasts for 6 or more years (and still going) is a much better use of oil. PET polyester does NOT leach anything into food. It is an inert material well-known to be food-safe and BPA-free. And Envirosax is in the process of switching to recycled PET for their bags, making them even more eco-friendly. Envirosax also makes a bag out of bamboo. This is from the company website: “It’s true, Envirosax are made from polyester which is a plastic. The fundamental problem with conventional plastic bags is not that they are made from plastic, it’s that they are not designed to be re-used. 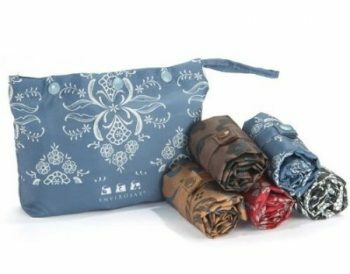 It is extremely lightweight and allows the bag to be rolled up into a very compact package, which encourages people to carry them with them and increases re-use. It can be printed by sublimation, which means the print will never fade and the bag will look good for its whole lifetime. Each person must make their own decision with regards to what kind of reusable bag works best for them, but Envirosax are a great choice if you are looking for something attractive, functional and very, very easy to remember everywhere you go. And that’s what counts: Remembering to use them EVERY TIME you shop. This is a topic that is so very near and dear to my heart, and the picture of that albatross with plastic in its belly literally brought a tear to my eye. Vigilance is key, and informative posts like this one, with all of this helpful information is what we need to wake everyone up to the atrocities that we’ve committed to this beautiful planet of ours. Thanks again for a wonderful post and for linking up with us at Tiny Tip Tuesday. I’m sharing this on FB right now! Thank you, Sarah. The albatross picture really got me too. It is part of a series of pics of marine mammals that will really break your heart. Always glad to be of service to the earth! YES, I use reusable bags as often as possible. But please let me clarify the trees that are cut down from brown paper bags are REPLANTED. Our livlihood depends on a paper mill and much of the surrounding area here in Cantonment is surrounded by pine forests. To report trees are cut down without including the replanting is a bit lop-sided. Not all of the 14 million trees used each year for paper bags are replanted by any means. In fact, most are not, particularly when the bags are made in other countries and imported for use in the U.S.
As a certified arborist, I can tell you that by cutting older trees down, we lose most of the benefits they offer, even when replanting. The value of a fully mature tree to the health of our air, water, soil, climate and biodiversity is a thousandfold greater than that of a sapling. In fact, it can take decades for a newly planted tree to begin to provide any substantial benefit to the environment around it. What a loss just for a throw-away paper bag! We could put the trees and the paper from your mill to much better use. Our local mill no longer makes bags. They make liners for kraft boxes and copy paper. I know this particular post concerns paper/plastic/reusable bags. But there are so many other uses for paper products. I also feel we need to step back and consider our individual use and waste of everyday products. We must at this time also take a hard look at keeping jobs here instead of sending jobs overseas. Florida no longer allows industry unless it’s tourism related. That leaves our college educated children with few choices locally, unless they want to work at a restaurant or hotel.The paper mill in question has reduced in size by half over the last 30 years, and Escambia County is among the poorest (if not THE poorest) in the state. We go shopping about once every two to three months. We buy two to three cart loads of food. That would make for a huge number of reusable shopping bags and it doesn’t make sense to do that. If we shopped frequently and just bought a little at a time a reusable bag would make sense but then that would waste a huge amount of time and fuel going to the store frequently. It’s an hour’s drive. Besides, the paper bags are so useful at home for so many things. After they can no longer be reused, shredding and composting the paper bags is the only sustainable way to dispose of them. I hope you get to do that! A great way to transport a big shopping load is to reuse cardboard boxes. Many stores will provide some if you ask, or you could bring boxes you have at home. As long as you don’t pack them too heavy to lift, they make carrying all the groceries inside a much quicker process. Do you have any ideas for how to dispose of dog poop without using plastic bags? We’ve been reusing our plastic bags in that way instead of buying the plastic pet bags, but after reading this I’m rethinking it. We have a very small yard. Years ago my sister had big dogs and put a big steel drum without it’s bottom into the ground in her back yard. She scooped poop and put it into the drum and would periodically add some dirt. That was long before the plastic grocery sacks we so prevalent. Do you have a referral code for Envirosax you would like to share? According to their website, new customers get a free gift and can save an additional $5 when we have a customer referral code. Oh, and you get $5 credit too. 🙂 Seems like a win-win to me! Thanks! Now I’m anxiously waiting on my bags to arrive. 🙂 They have quite a wide selection of products! I keep my reusable bags in my car. At first, when I would forget to bring them in, I would force myself to go back out to the car and get them before I checked out. I figured the exercise it took could only help me anyway. Now, in ever forget them! I use ones that I bought years ago at the grocery store… They aren’t cloth, so they hhold their shape and don’t shrink. I wipe them down with a cloth. They must be astin coated, but I’ve used them literally thousands of times. They are so pretty, too. Everyone wants to know where I got them! Me too! And my supermarket has a reminder sign posted on the door. This is a great article but I am very curious about some of the statistics on paper bags because there are a lot of us who use those instead (at least when we forget our reusables) and while I know it’s not perfect, it really is better than the plastic bag scenario, especially since they are biodegradable…. I’m just curious if there’s any statistics on those. From the article and the sources at the end of the article: “Paper bags are even worse than plastic bags. Each year, Americans use about 10 billion paper bags, which results in the cutting down of 14 million trees. Four times the amount of energy is used to manufacture paper vs. plastic bags, and 98 percent more energy is used to recycle paper vs. plastic bags. Paper sacks generate 70 percent more air pollution and 50 times more water pollution than plastic bags. Paper bags DON’T biodegrade in a landfill. That is a common myth. Very little in a landfill ever decomposes, even food gets fossilized forever. The only way to ensure your paper bags biodegrade is to shred them and put them in your compost pile. Paper bag production also adds to climate change in two ways: Forests (major absorbers of greenhouse gases) have to be cut down, and then the subsequent manufacturing of bags produces greenhouse gases. However, plastic bags are not the more sustainable solution as they use more fossil fuels and raw materials energy, and consume larger amounts of crude oil and natural gas than paper bags. Since paper and plastic are both TERRIBLE for the environment, energy independence and state budgets, the best answer is to bring your own bags. Ok, I have kind of a strange question: once I get my bags INTO the store, how do I get the bagger to use them before s/he starts automatically putting my things in plastic? Because often, when I walk up to the cashier, I’m herding 6 kids and trying to find my wallet, and…you know. And I end up forgetting to say something until half my stuff is already bagged. So what has worked for you? Do you put them on the belt first before your items? Because like the earlier commenter said, it’s still not so common here in NC, sometimes I get the “what are these for?” looks. Anyway, just wondering what I’m doing wrong here! Thanks for your help! I put my bags onto the checkout counter before I put anything else. That way they are the first thing the cashier sees. At non-grocery stores, I often get strange looks, but I quickly and politely state that these are my shopping bags, if they wouldn’t mind putting my items in there, please. Yes, what you said is exactly what I do. I have it a little easier than you, though, I’m empty-nest so I don’t have kids to herd. I put my bags on the conveyor belt, THEN my groceries. So far I’ve got some funny looks, but every cashier/bagger in every store including the Wal-light Zone and Target has caught on quick enough and just used them. Veronica, if you’re in NC, Lowes Foods and Target both have little discounts for using your own bag – not that much, I think it’s $0.05 per bag, but still they are trying to show that they appreciate you not running up their bag costs. As part of the effort to implement that law, I’ve never been prouder to live in the District of Columbia. And it’s working. The stores are reporting far fewer bags consumed. For me, the biggest change is to walk into a place and hear cashiers routinely asking customers if they want a bag — instead of automatically assuming so. Thanks for your work, Alan! I’m so glad my hometown has been among the first of great green cities in the U.S. to help us phase these bags out once and for all.